When you are not available to answer calls, it's a great idea to send your customers straight to voicemail. Here's how it works in OpenPhone. When you're Active, you receive all incoming calls and messages. When you turn on "Do Not Disturb", your calls go directly to voicemail. You'll still receive notifications for missed calls so that you can call your callers back, but your phone won't ring. If you get voicemail, it'll be transcribed and texted to you together with the audio file as per usual. You still receive text messages like you normally would. When you're ready to receive calls again, simply tap on "Do Not Disturb" to turn it off. That's it! 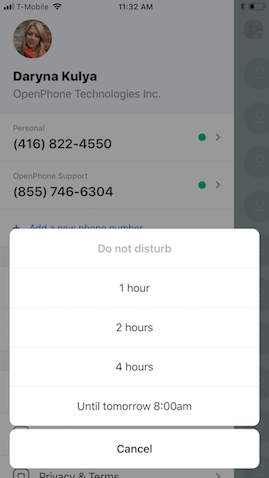 Want to set your business hours so you don't get calls when you're done working? Learn more here. 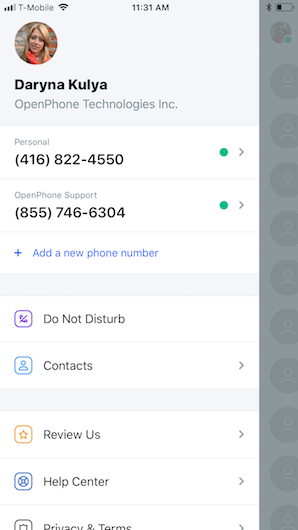 Enjoy OpenPhone and let us know if you have any questions!